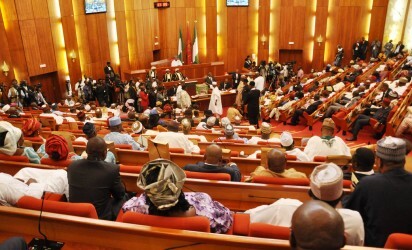 ABUJA- FOR more than twenty- five minutes Wednesday, the Senate plenary was held amidst rowdiness over sitting arrangement. Trouble started when the former Senate Minority leader, Senator Godswill Akpabio, All Progressives Congress, APC, Akwa Ibom North West called for recognition to speak, but the Senate President, Dr. Bukola Saraki refused him on the grounds that he cannot speak, using another Senator’s microphone to speak. According to Saraki, Akpabio can also not speak from a seat where there was no Microphone. Akpabio stood up to speak shortly after the Chairman, Senate Committee on Gas, Senator Bassey Albert Akpan, Peoples Democratic Party, PDP, Akwa Ibom North East, had raised the alarm of alleged plans by the APC in the State it cause mayhem and to ensure that the 2029 general elections do not hold in the state which has before now adjudged one of the most peaceful states in the country. Saraki refused Akpabio to use the Microphone of the former Senate leader, Senator Ali Ndume, just as he said that since the former Governor of Akwa Ibom State was sitting on a seat where no micriphone, there was no way he would be allowed to raise any issue there. For this reason, the hallowed chamber became very rowdy as the Deputy Senate President, Senator Ike Ekweremadu and Senator Emmanuel Paulker who made frantic efforts to speak on the issue could not speak. It would be recalled that Akpabio has resigned as the Minority leader in August having dumped the PDP for the APC.